Program advisory committee meetings are primarily intended to provide the members an opportunity to interact with program personnel, evaluate the program’s learning environment, and assess the progress of the program’s goals and initiatives. Advisory committees should strive to streamline formal face-to-face meetings as much as possible. Industry professionals will demand that you utilizing their time and expertise efficiently. Providing materials for review in advance, either by email, regular mail, or other digital technologies, can ensure that meeting time is reserved for interactive discussions and decision-making. How do I best communicate the schedule of meeting? Organized meetings are one of the keys to a successful advisory committee. Establishing a meeting schedule at the beginning of the academic year will allow committee members to plan their calendars accordingly. How often should my committee meet? Each committee must meet a minimum of two times annually. (Electronic meetings are acceptable). The work plan will dictate the number of meetings. Meetings should NEVER be called simply for the sake of holding a meeting. Attendance must be tracked and members who are not able to make the agreed upon number of meetings should be dismissed from the committee. Every committee should occasionally invite the instructional chief executives (e.g., chancellors, presidents, superintendents, or principals) to participate at their meetings. The presence of executive personal underscores the importance of the committee and the value of the program within the community. During meetings with executive attendance, members should feel welcome to provide feedback regarding institutional issues that impact the program’s capacity to meet the student’s instructional needs. NOTE: Committee members enjoy interactions with the students in the program! Invite students to meetings on a regular basis to: give presentations, allow time for mock interviews or other interactions, and provide students the opportunity to serve on a discussion panels. When is the best time to schedule meetings? Meeting times should be convenient for the business/industry members and scheduled as far in advance as possible. Regardless of what time a meeting is scheduled, most members will appreciate refreshments. How long should each meeting last? A meeting does not need to be long to be effective. The constant should be quality of content, not time. Most meetings will last one to two hours given the nature of the agenda. When it comes to scheduling, most committee leaders generally underestimate the time required to facilitate meaning meetings as well as the time members are willing to commit. Where should I have my meetings? More important than where the meeting is held is to communicate the schedule of the meetings with as much notice as possible. Meetings can be held at educational institutions, a local restaurant, or the company. Regardless, the location should be whatever is most convenient for the majority of the committee’s members. Subcommittees are a great way to tackle large or specific issues and avoid redundancy during meetings. Subcommittees may be responsible for researching topics and presenting the committee with recommendations for voting or other consideration. Meeting discussions should focus on the agenda, and every attempt should be made to involve each member. Time should be allowed for open, free discussion on the strengths and weaknesses of the program. The committee chair should be able to draw on the expertise of individual committee members and not let any one member or school official dominate the discussion. Why should I establish ground rules for meetings? 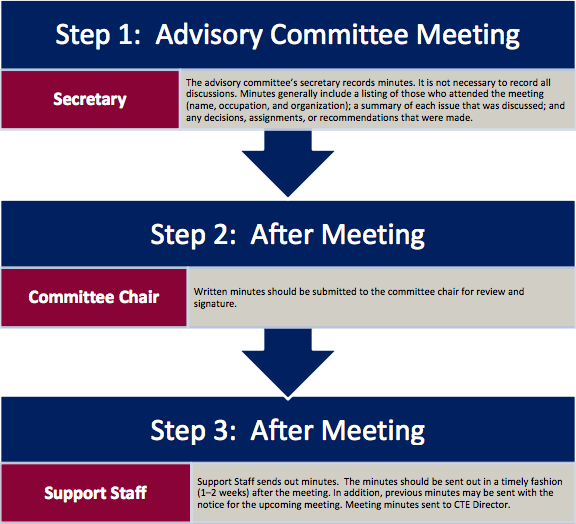 What should my role be for the advisory committee meetings? Facilitation of the meeting should be done by the committee chair! Our Ag Ed Advisory Committee (consortium) is composed of numerous leaders within every facet of the industry, which includes a variety of local agriculture professionals. This Ag Ed Advisory Committee has been operating since 2002, meeting at least four times a year to discuss goals that are in place now to ensure student success. In order to maximize the available resources for students to choose a valuable SAE, which will teach them skills pertinent to their future career, the agriculture department has implemented ways to ensure our students will have a great SAE experience. Recently, we adopted a new office position within our Advisory Committee of SAE coordinator. This person specializes in assisting students with finding possible SAEs, particularly placements. Two years ago, we restructured the Advisory Committee to encompass a grants manager. The primary purpose for the grants manager is to seek out and initiate grants for the program and maintain a grants notebook. Hopefully with this person in charge of grants, the program will be able to sustain our forecasted budget crunches. Well-organized meetings add to the advisory committee’s effectiveness. Busy committee members are more likely to remain involved when their time is used well. An evaluation should be given after each meeting. Make sure you have an agenda for every formal meeting. Agendas and meeting materials should be distributed ten working days prior to each meeting. Meeting agendas should have regularly scheduled topics (agenda samples). Set the tone for the meeting. Put times down on the agenda if you have trouble staying on task. Try to identify “theoretical discussions” and make sure those items are saved for the end of your agenda. Likewise, make sure all of your “action” items occur toward the first half of the meeting. If possible, assign any individual tasks or information gathering prior to the meeting. This will eliminate unnecessary meetings. Give an end of meeting evaluation. What should be on the agenda? The agenda should follow the Program of Work for the year and encompass all aspects of the program. Focusing on a variety of issues will keep conversations productive and stimulating. Meeting foci commonly include: resource generation, student learning initiatives, student demographics and trend data, facility resources, intern and graduate placement, faculty and student recruitment and retention, forecasting of employment opportunities and strategic planning, curriculum and student assessment, program policies and procedures, and professional development opportunities. Committees should focus discussion on what the program should be doing instead of on what the program is currently doing well. Am I required to have meeting minutes? Yes, All Advisory Committees are required to keep the minutes from each meeting on file with the CTE director. Advisory Committee meeting minutes (with program specific guidance) must be kept on file for the previous five years or back to date of approval for new programs. Meeting minutes should capture action items and other critical information that occurred during the meeting. What will happen to my program if minutes are not recorded? Advisory committees should create communication channels that help to maintain close employer-educator relationships that go beyond those established through formal meetings. The ability of the committee to make decisions during meetings will depend to a large extent on how well the members communicate between meetings. Don’t hesitate to involve committee members in all school or college events, such as fundraisers and exhibitions. Notifications on activities at the school/college work well to broaden the advisory committee member’s knowledge about the overall institution not just the specific program. Public access link—This link would lead the viewer to information that is of interest to the public, such as general information on the program and the activities of the committee.